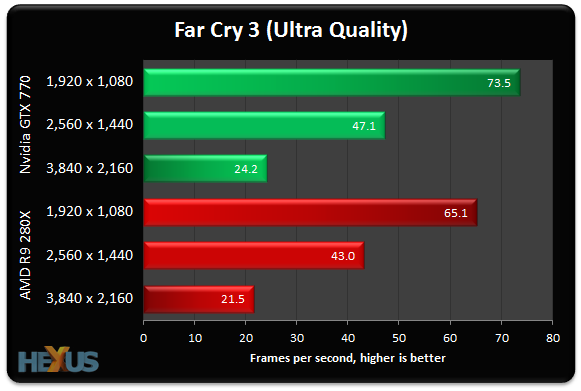 Open-world gaming at its very best, Far Cry 3 redefines the genre through breathtaking visuals and first-class gameplay. 2x AA and ultra settings look and play great at the two lower resolutions. 4K performance is less than half that of 2,560x1,440, which kind of makes sense as the pixel-load is over 2x higher. 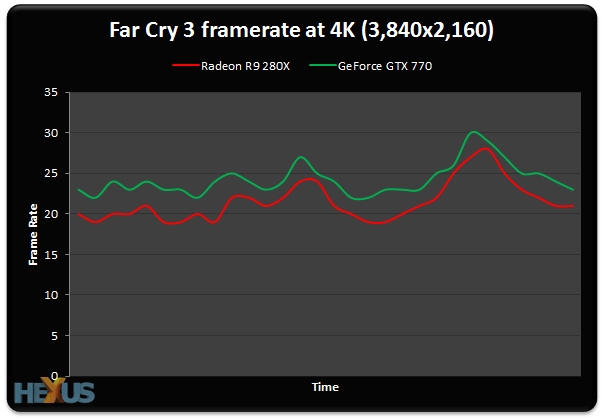 The GeForce remains quicker but its lead is reduced at 3,840x2,160. Both cards produce consistent performance that still falls under the 30fps threshold that we require for basic gameplay. The GeForce is playing it close to the wind as far as the framebuffer usage is concerned; the game requires a smidge under 2GB at our chosen settings.